Aside from a trip to the tropics, there’s nothing like a splash of color in the heart of the home to offset Portland’s gray, rainy winters. Here, beautifully tailored, aqua-blue cabinets­—part of a traditionally rooted yet thoroughly modern kitchen update—bring a touch of tropical warmth to an Eastside home. Sitka Projects, the Portland remodeling company that created the new space for a family of four, prides itself on creating beautiful and functional spaces that help clients work and relax at home. 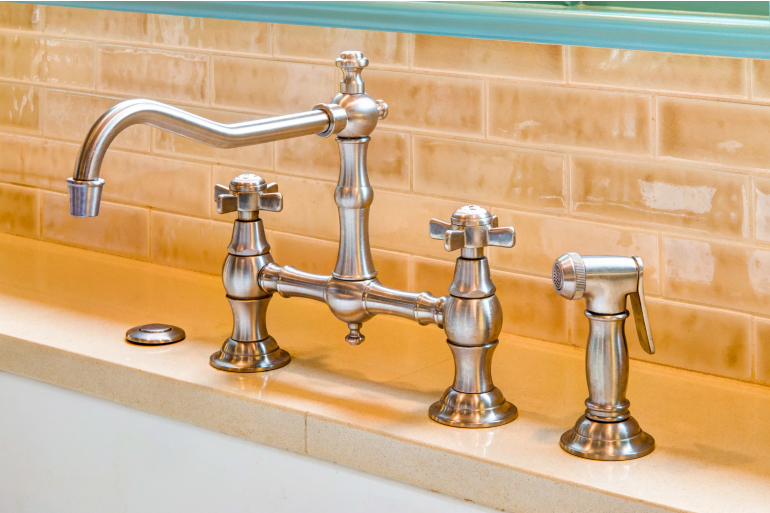 The family-owned firm specializes in kitchens and bathrooms, with a heavy focus on woodworking. This period-appropriate, highly functional and happy-feeling kitchen showcases the company’s rich aesthetic and attention to detail. “We reference and check our designs against industry design standards to make sure our clients are receiving the best possible product for their investment,” says Sitka Projects owner Bradley Bowsher. We sat down with Bowsher to find out more about this upbeat kitchen, which replaced a much older and rather depressing cook space in this 1916 Craftsman home. What was this space like before the remodel? It lacked the essential areas for food preparation, storage, cooking and cleaning. The cooking area was all but nonexistent, with a little landing area for prepared foods. Perishable and nonperishable goods were homeless as well. In terms of the aesthetic of the space prior to our work: Well, pictures are worth a thousand words! 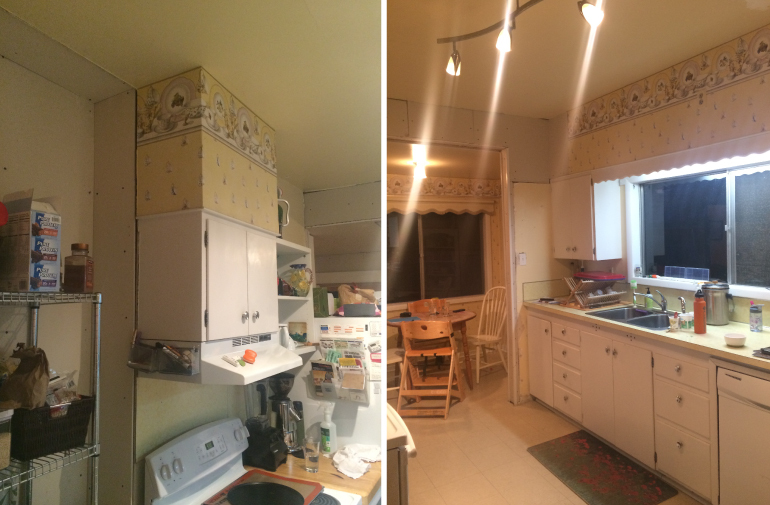 The kitchen had been remodeled several times since the home was built in 1916, and I believe the last remodel effort was done more than 30 years ago. We assume earlier homeowners or a handyman performed the work due to the fact that we ran into electrical and structural concerns. What did the homeowners hope to achieve with this remodel? They wanted a modern, functional kitchen for themselves and their two daughters, and they wanted it to meld aesthetically with the time period of the home. They cook quite a bit, so having well-organized work centers and storage was vital. They also wanted plenty of outlets, lighting and a phone-charging station. To create some of the new spaces, we used an existing void between the kitchen and formal dining area that had once been either a chimney or utility corridor. We somewhat had to design as we went as we had an idea of what was possible, but firm dimensions didn’t reveal themselves until after demolition. 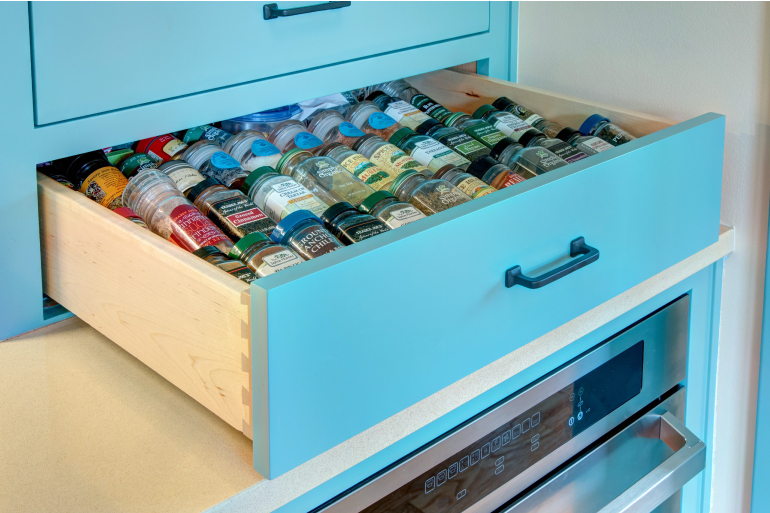 This, combined with the need to locate drawers and appliances in proximity to these pullouts, made this phase of the project a bit tricky. How do the homeowners feel about the new space? They chose the aqua color with a designer friend. I was very happy to finally do something besides white, off-white, bone or linen! The owners love their new kitchen. For them, it’s a night-and-day difference between what was there before and the warmth and livability there now. The organization and function allows them to enjoy the space more, and they report now they are eating more meals at home.